Is There Evidence That Playing Didgeridoo For Sleep Apnea Can Help People? In 2005 The British Medical Journal reported on a successful study conducted at the University of Zurich in which researchers hypothesized that regular didgeridoo playing could be an effective treatment for obstructive sleep apnea. The sleeping disorder is characterized by pauses in breathing during sleep, often leading to daytime restlessness. A participant playing didgeridoo in the sleep apnea study. Image: BMJ. What were the results of the didgeridoo for sleep apnea study? Participants were tested at the beginning and end of the study for four different quality-of-sleep and daytime sleepiness indicators and were then compared to a control group that was not allowed to play the didgeridoo. For each indicator, the group that practiced the didgeridoo made significant improvements compared to the group that did not. The most significant indicator used in the study is the Epworth scale, a measurement of daytime sleepiness (the higher one measures on the scale, the more daytime sleepiness the person experiences). The figure below shows that those who practiced the didgeridoo saw their level of daytime sleepiness decrease, while those in the control group saw various changes, including testing better, the same and far worse. Results from participants in the didgeridoo sleep apnea study, plotted on the Epworth Scale (a self-reporting metric). Image: BMJ. The didgeridoo for sleep apnea study was hailed as a success but only through continued research will we know the true effects of playing the didgeridoo to treat sleep apnea. 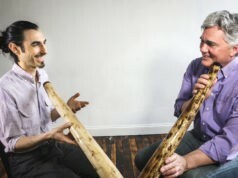 It is unclear the level to which the participants mastered circular breathing, a technique which often challenges newer didge players. Enhanced results could potentially be found in longer experiment periods (greater than four months) and more in-depth and frequent didge lessons. What is the best way to start playing didgeridoo for sleep apnea? 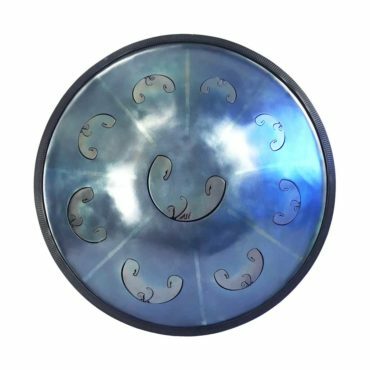 After seeing positive results working with over 50 people with sleep apnea, I decided to create a method book and video that anyone could use to learn to play didgeridoo, right in their own home. Thus, Didge For Sleep was created. 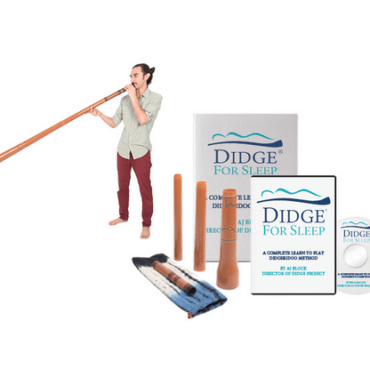 Didge For Sleep is a DVD and Handbook (also available online) designed specifically to teach the didgeridoo to people with sleep apnea, snoring and other related conditions. 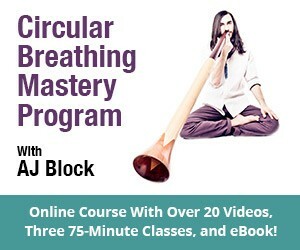 Focusing particularly on strengthening the muscles of the throat and tongue and the entire respiratory system, this course starts with the absolute basics of breathing and gradually increases in difficulty up through some fun intermediate level rhythms. 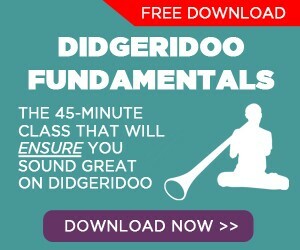 Want to learn to play didgeridoo directly with a teacher? Check out our current course offerings. 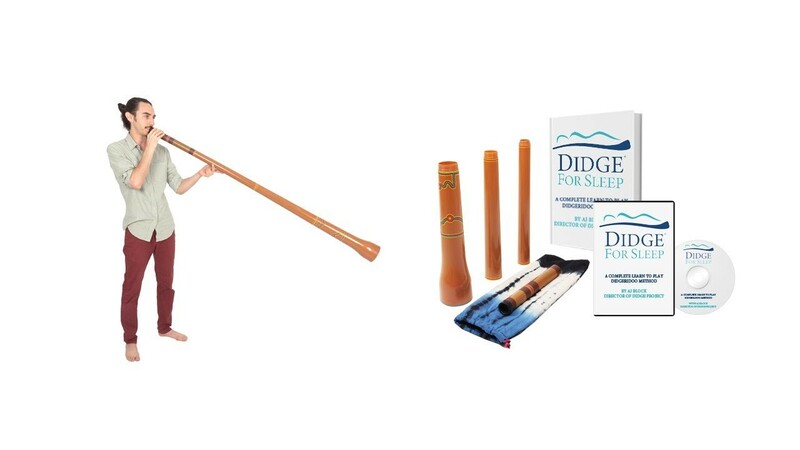 The Didge For Sleep Introductory Package includes a 90-minute tutorial DVD, 37-Chapter Handbook, Travel Didgeridoo, and access to our online video library (over 10 hours of tutorials) and member discussion forum. 1) Any suggestions on where to find a decent lower cost didge to help with sleep apnea? 2) What part of playing the didge is most important for sleep apnea? Is it the circular breathing? 3) Will playing the oboe or high tones on a trumpet or another more meoldic wind instrument elicit the same good results? Hi David, Thanks so much for writing. 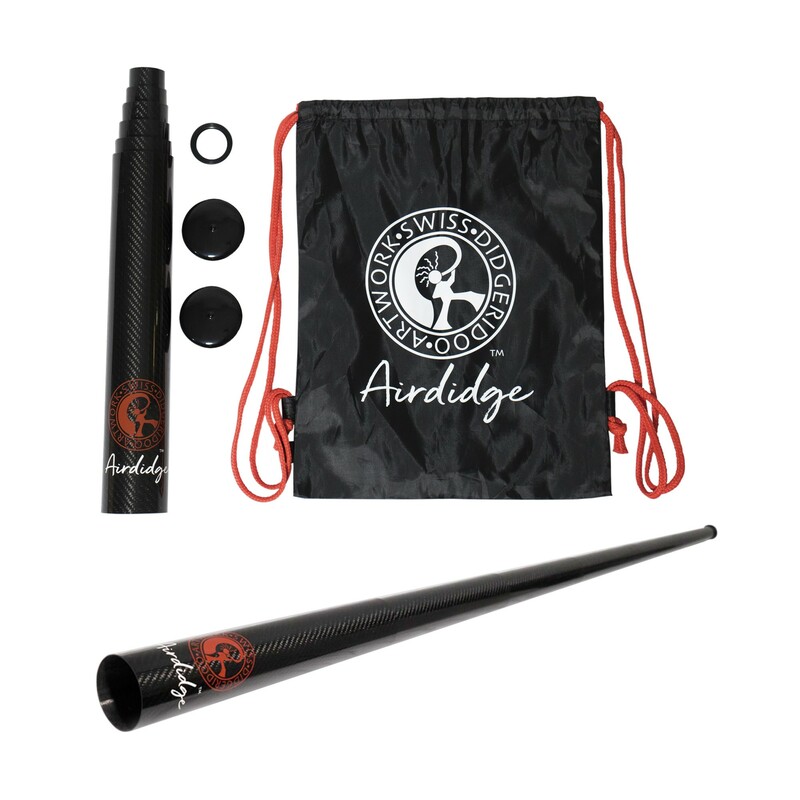 To answer your questions: 1) a great low cost portable didge is our 4-piece travel didgeridoo. It’s great because it can fit in any backpack or suitcase and sounds great! 2) The most important part of didgeridoo playing for sleep apnea therapy is strengthening the throat and tongue muscles. Exercises that work the tongue and focus on getting a good quality sound are ideal for this. Check out this video on how to get a good sound for some of these practices: Getting A Better Drone Sound. 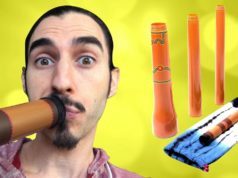 3) I can’t speak for other wind instruments, but I will say that the didgeridoo works because you need to have a very relaxed throat and lips to play. Trumpet requires much tighter lips and higher levels of face tension; I know this from my experience playing it. I don’t know much about oboe playing so can’t comment on it with respect to sleep apnea. I hope this reply has been helpful to you and our readers. Please let us know if you have more questions! a) My first didgeridoo was made of PVC tubing wrapped in nice material fitted with a mouthpiece of beeswax. You may try this version if craft-making is your thing. Note: keep this out of high heat in the car as the beeswax will melt down the material… Actually best to keep all didgeridoos out of the heat as the bamboo ones will crack. b) Fiberglass didgeridoos are my current favorite because these are durable, easy to play, lightweight, affordable, and consistently sound amazing. 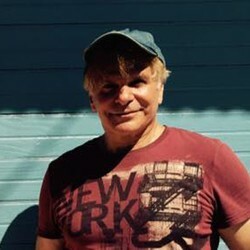 2) regarding sleep apnea, I find these aspects with my yoga therapy and didgeridoo clients: the sound is fun and silly to make – especially when we start the exploration & for sure! Laughter is great medicine for many an ailment – including sleep apnea! The oxygen-rich breath and the vibrational tingle around the mouth, nose, and head are new in the beginning. Once a regular tone is found, a relaxed ease is established that significantly decreases tension. Once a rhythm is established, circular breathing becomes a possibility. As circular breathing is found, the brain remaps the muscle actions in the back of the throat to simultaneously engage and relax. 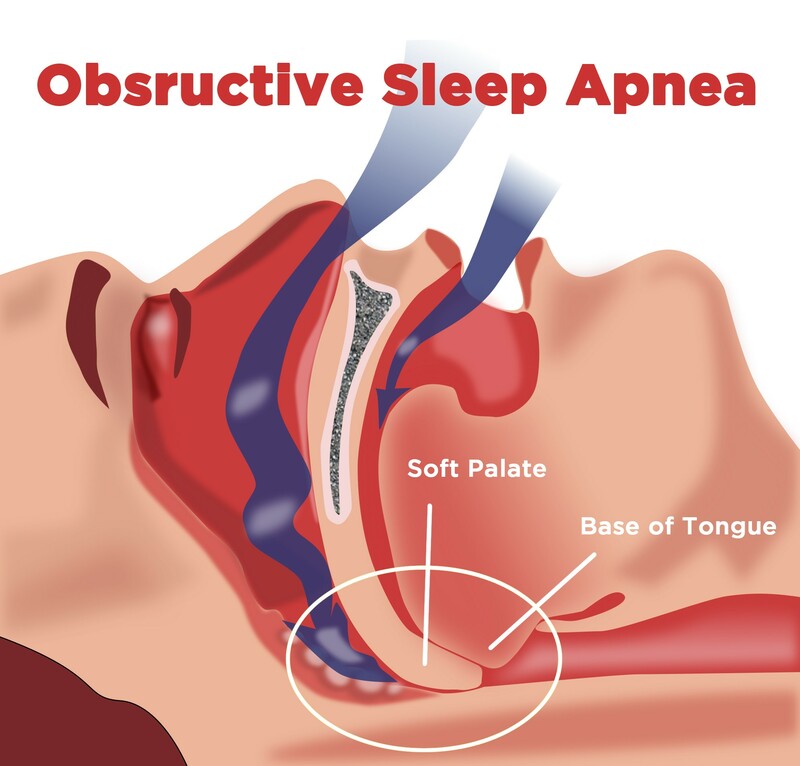 As a result, sleep apnea decreases. 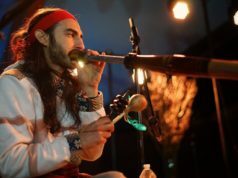 While any instrument can be a meditation and may yield positive results; the didgeridoo provides something particularly special in both tonal resonance and breath activation for me with my daily rhythms. See what works for you and write back! Hope that helps! & AJ thanks for this site! 2) What part of playing the didge is most important for sleep apnea? Is it the circular breathing? 3) Will playing the oboe or high tones on a trumpet or another more melodic wind instrument elicit the same good results?